If you’re a monohull sailor looking to sail flat and happy across Caribbean seas, West Coast Sailing School in San Diego can get you there. The classes below mostly assume you have 101 (basic keelboat) and 103 in the bag. If not, go here so we can get you in a class combo that makes sense for your needs. On this 3 day course (ASA 104 & ASA 114) you will board one of our cruising Catamarans usually on a Friday morning. An advanced cruising Standard (ASA 104) for individuals with cruising experience. You will be able to skipper 30 – 50 foot boats sailing by day in coastal waters. The Standard includes knowledge of boat systems and maintenance procedures. (ASA 114) An advanced cruising standard for individuals with cruising experience. You will act as skipper of a 30-50 foot multihull sailboat by day in coastal waters. The standard includes those skills unique to a 30-50 foot multihull, with the goal of passing qualified catamaran bareboaters. 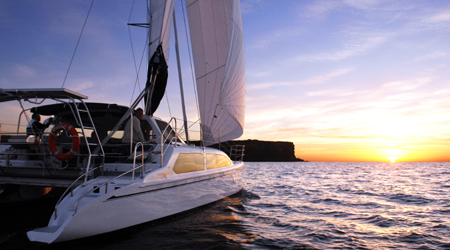 We teach most of our classes (such as ASA 114 Cruising Catamaran and ASA 104/114) on Full-Size Catamarans. Examples are the Seawind 1160, Fountaine Pajot Mahe 36 or Fountaine Pajot Helia 44. These are the size and type of boats used in bareboat charter programs around the world. Also, most charter companies require that you have training on full size catamarans to be qualified to charter their boats. We use our Gemini 35 Legacy for our ASA 103 Basic Coastal Cruising class, as it is a good size boat to introduce you to catamaran sailing.